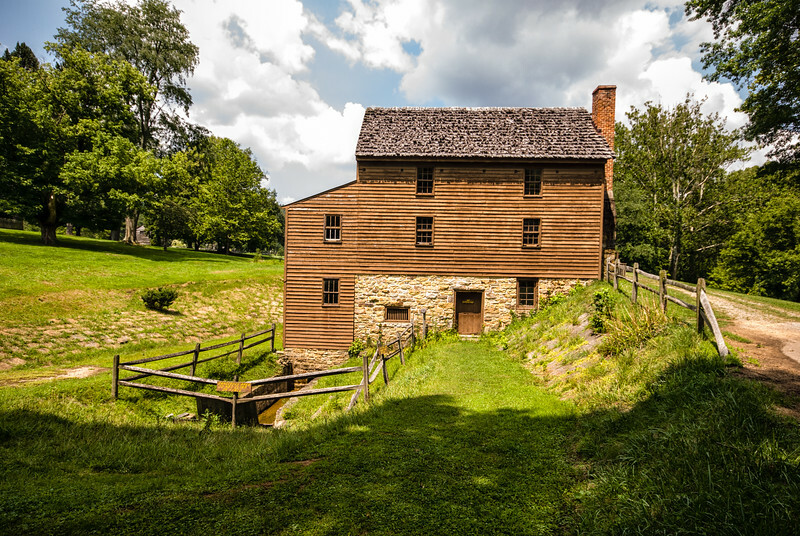 In Part 1, we looked at Jackson Mill itself and heard the story of the young Thomas “Stonewall” Jackson, who lived on the Jackson Estate from age 6 in 1831 until he left for West Point in 1842. Cummins Jackson left Jackson’s Mill in 1847 to search for gold in California and died there in 1849. 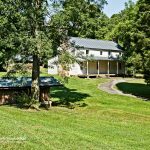 His property at Jackson’s Mill was held in heirship until 1868 when it was purchased by his sister, Catherine Jackson White. Upon her death in 1876, the farm was sold outside the Jackson family. In 1915, a five-acre tract of the original property, which included the old gristmill and the site of Cummins Jackson’s house, was purchased by the Mononogahela Power Company. In 1924, the property was donated to the state of West Virginia as a statewide meeting place for youth enrolled in the 4-H program. The first 4-H camp at Jackson’s Mill had been held in 1921. 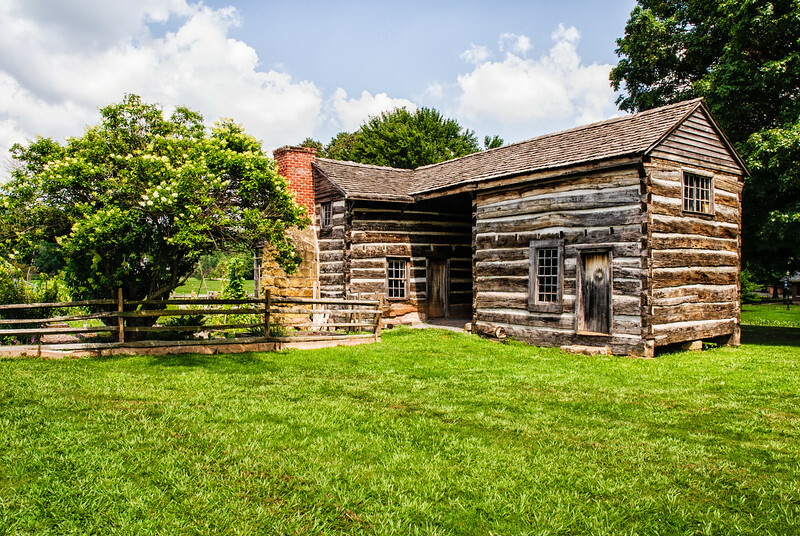 Other buildings added to the site include the McWhorter cabin (not shown), constructed in the 1790s near the neighboring town of Jane Lew and was moved to the site in 1929. 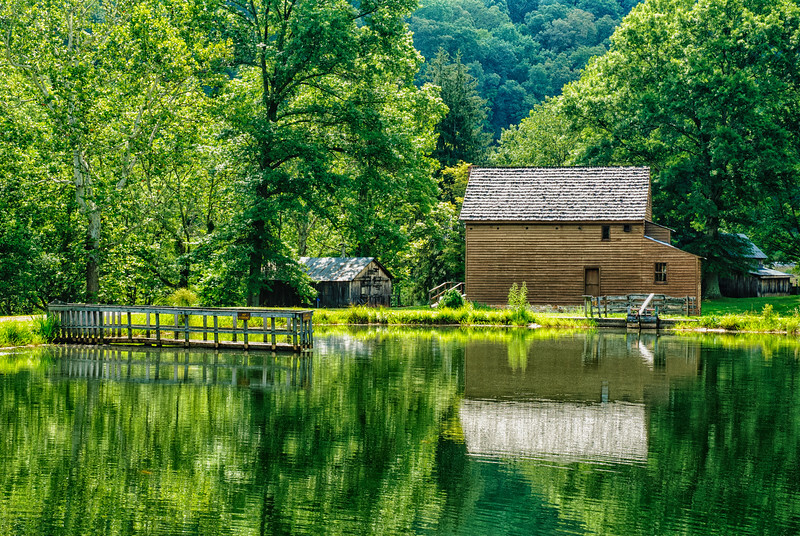 The building above is the Mary Conrad Cabin , which was originally located on a site in the village of Roanoke, Lewis County, that is now under the waters of Stonewall Jackson Lake. The land where it sat was first obtained in a land grant by George Jackson, brother to Colonel Edward Jackson, who started Jackson’s Mill. 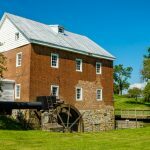 Robert Hockman Blaker of Wilmington, Delaware, donated the family’s mill that had been producing cornmeal and flour since 1796 to the people of West Virginia. 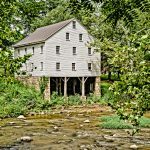 Jacob and Mary Hockman erected the gristmill at the confluence of Mill Creek and Muddy Creek soon after moving to western Virginia. 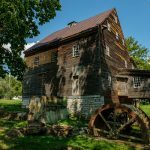 In 1842, about the time that Cummins Jackson was building the present-day Jackson family mill, the Greenbrier County mill was inherited by one of the three Hockman daughters, Susan, and her husband, George Lewis. They hired John Blaker, from Loudon County, Virginia, to work in the mill. He eventually married Susan Lewis, probably the granddaughter of George and Susan (Hockman) Lewis. Three of their children, James L., Mamie, and Ida, operated the mill until it closed in the mid-1950’s. Robert Hockman Blaker is James’ descendant. 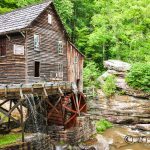 With funding from many sources including $150,000 raised penny by penny and dollar by dollar by the West Virginia Extension Homemakers, Blaker’s Mill was carefully disassembled, stone by stone and board by board, and transported to Jackson’s Mill as a giant jigsaw puzzle. Monies were expended on historical architects and consultants, but the backbreaking labor and ultimately, the major part of the reconstruction, was accomplished by volunteer labor. 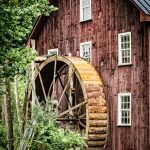 Because it was not possible for Blaker’s Mill to be powered by the waters beside its new home on the West Fork River, a millpond was constructed to hold the rushing water that turns the giant grindstones. Water is pumped to the pond from the nearby river by electric powered pumps and returned to the river via a specially made drain. Beautiful shots as usual, Mark. I really like the second. The reflections and all of that “green” . . . Gorgeous! Terrific images Mark. Well composed, super details. Great images Mark. Absolutely love the clarity and reflection in number two! Great background information to go along as well. Love these images Mark and great to hear the history behind them. Nice work Mark. Lovely vivid images today! Cracking set and informative post as always!